Help! Why Do I Have Lifting Floor Tiles In My House? CRACK! Have you ever heard this sound and walked into your kitchen to see that your tile flooring is a little strange? Did you notice that the tiles seemed to be lifting away from the ground beneath, or “tented”? Many homeowners have had similar experiences. It catches everyone off guard and seems to happen for an unknown reason. But, we want to help solve that mystery of lifting floor tiles by giving you a few reasons it could happen. It may seem like common sense, but the lifting floor tiles in your kitchen could be caused by the simple dropping of a pot of pan. If you’ve ever dropped one of these heavy objects, it might have damaged the tile, even if you didn’t see a crack at the time. Over time, you might see the tiles begin to lift. Sometimes, moisture can cause lifting floor tiles. Often, the moisture can come up through the concrete. It pushes the tiles upward and makes them appear to be lifted. The moisture could also be from leaking or a plumbing problem. The excess water could make your tiles lift and form a “tent-like” structure. If the carpet was poorly installed, your tiles will eventually begin to lift. It might happen after a number of years. The tiles may not be perfectly attached to the concrete. If that’s the case, then the tiles will start to loosen and lift. Lifting floor tiles can also be caused by the moving of the surface below the tiles. Sometimes, the surface expands, which loosens the tiles. In other cases, the concrete below can crack. This might also make the tiles lift. The cracking and expansion of the concrete normally happen when the weather is warm. When the weather is cool, buildings tend to contract. If heat is turned on in the house, it creates a lot of pressure in the room. So, the tiles may lift as a result. There are some DIY methods for dealing with lifted or “tented” tiles. Some options give tips on how to adhere the tiles back together. Your local hardware store might carry some kinds of adhesives that are designed to help you repair cracked tiles. The method you would use completely depends on the amount of damage as well as the kind of tile you have. Unfortunately, trying to repair your flooring alone can be hard. 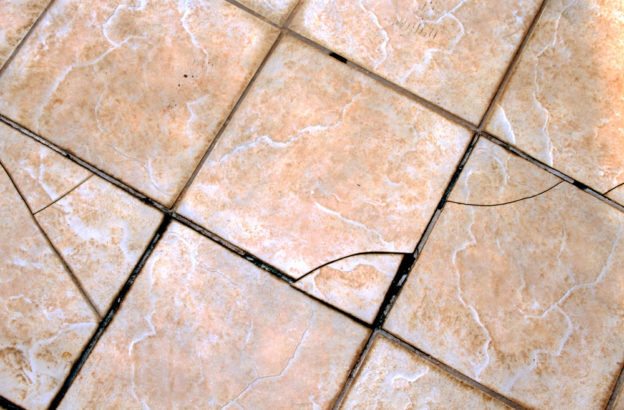 While you try to remove the cracked tiles, you could possibly damage the surrounding tiles. Of course, this would be really frustrating and end up taking more of your time. So, if you have lifting floor tiles in your house, it’s probably best to completely remove the cracked tiles. If you have more tiles, you could possibly replace the cracked ones. But, it might be easier or better to change the flooring altogether. That way, you can avoid future problems. Here at Dust Busters Floor Removal, we know how important your time is to you. You certainly didn’t expect your flooring to lift and weren’t planning to have to deal with it. We get it! That’s why we work quickly and thoroughly to remove flooring that isn’t working for you anymore. It’s our goal to make sure you’re happy with your floors. And, removing the old floors is how we start that process for you. If you need to get rid of “tenting” or lifting floor tiles, give us a call at 866-883-8783!